Star Trek Enterprise: The Full Journey - Blu-ray Review - ReDVDit! The year is 2001. The TV climate is starting to change, but slowly, starting to favor continuous storytelling and expanded character development in hour long television programs. Star Trek Voyager has just ended, on more of a whimper than a bang, and even the X-Files is starting to lose its luster. We’ve had roughly 15 years of straight Star Trek, with both The Next Generation, Deep Space Nine, and Voyager running 7 seasons each, and a slew of average to mediocre feature films based on the Next Generation cast. Ratings slipped for both DS9 and Voyager, signaling a potential exhaustion of the viewer base for new Star Trek. Pressed by Paramount Television, Voyager showrunners Rick Berman and Brannon Braga were asked to commission a new Star Trek television program for the new millenium. Decided they had run their course with 24th century storytelling, they turned their eyes to the unexplored history of the Star Trek universe, settling on a show about a pre-Captain Kirk starship, an earlier Enterprise that carried out a mission of exploration nearly a hundred years before the historic 5 year mission of the NCC-1701. In essence, they tried to make a new Star Trek program in a time period that they could mold to look dissimilar to the last 21 seasons of Trek, going as far as dropping the Star Trek brand, titling the show simply Enterprise. With this new prequel starship, they were somewhat able to free themselves from the restrictions of 24th century socio-political establishments, creating a Star Trek show that is in essence an attempt to reboot Star Trek. 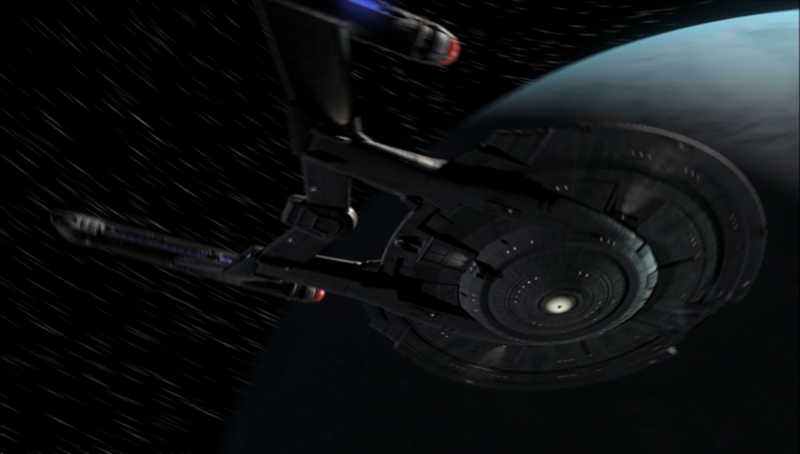 The resulting show, which aired for four seasons from 2001-2005 on the now defunct UPN network shares the same exact formula as the Treks before it, in that an Enterprise crew must fly off into the vast depths of space to seek out new life and experiences, but it places the crew in an untested ship, the NX class starship, which is the first Earth starship capable of Warp 5 speed. 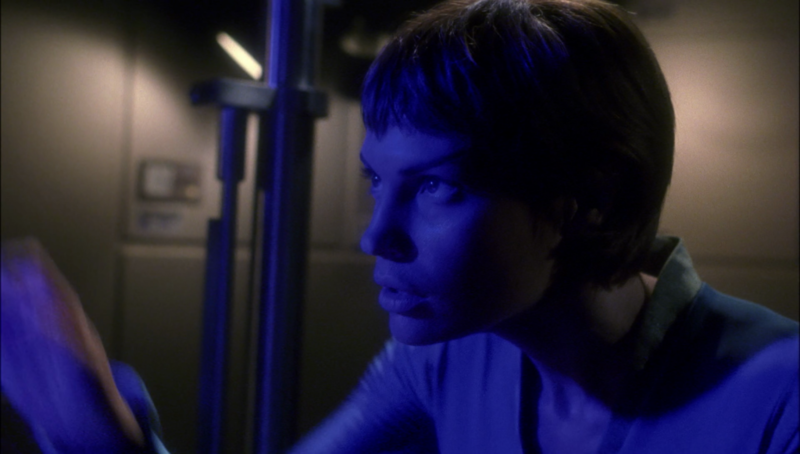 Much of the show’s early episodes deal with its limited capabilities, highlighting the naievity of a young Starfleet, as mankind battles the unknown for what seems like the first time. At the same time, the crew, captained by Starfleet veteran Jonathan Archer, is watched over carefully by the Vulcans, who are depicted as cold, logical, and somewhat antagonistic to the goals of Starfleet. On his voyage, he is joined by senior staff members Trip, his southern chief engineer, T’Pol, his Vulcan science officer, Malcom Reed, his English tactical officer, Mayweather, his cargo freight born and bred helmsman, Doctor Phlox, his Denobulan chief medical officer, and Hoshio Sato, his linguist expert and comm officer. They work together over 97 episodes to protect Earth’s interests, explore unknown worlds, make first contacts, and forge new alliances in the far reaches of space. 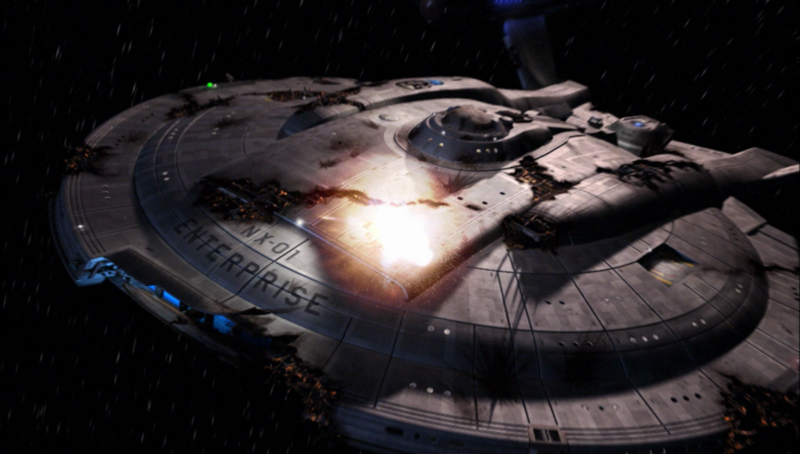 Season one of Enterprise starts off strong with its pilot Broken Bow, which focuses on Captain Archer assembling his crew in order to launch the NX-01 Enterprise as fast as possible, to prove to the Vulcans that they can protect themselves on their own when a Klingon warrior is injured chasing an enemy on Earth. 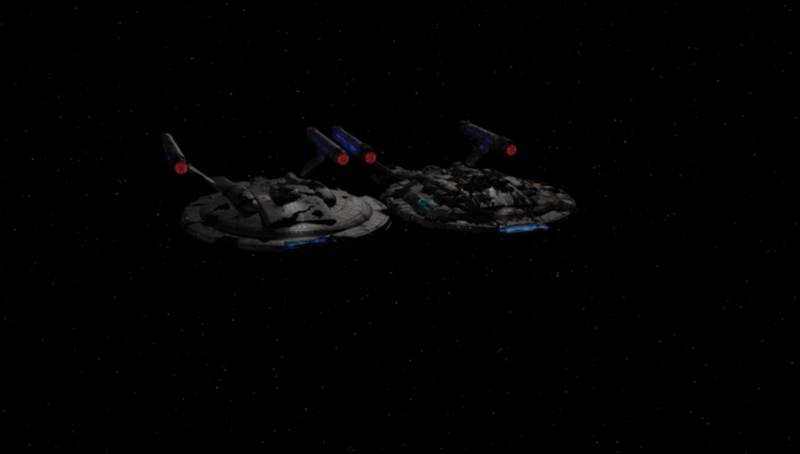 They’re forced to head out early, and rush as fast as they can to save Earth from the potential wrath of the Klingons. On their trip, they’re intercepted and attacked by a new race known as the Sulibans, who kidnap the Klingons. It is later revealed that these Suiliban are working with a presence from the future who is trying to alter the course of history, introducing Enterprise’s long running story arch, the “Temporal Cold War.” Captain Archer and his crew must do everything they can to stop the Sulibans from carrying out a plan that will spark a civil war amongst the Klingons, which establishes the capabilities, or lack thereof on board Enterprise, and the strengths of each of the various crew members. The season continues on to show the Enterprise and its crew go on their mission of exploration, where they encounter deadly diseases, hostile aliens, and introduce several recurring characters that periodically show up through the run of the show, such as Crewman Daniels, a time traveler who works with Captain Archer to save time, and Commander Shran, a leader of an Andorian ship who overtime befriends the crew of the Enterprise. Together, the senior staff solve mysteries, face enemies, and encounter a number of strange situations in a mostly episodic manner. Season One is, for the most part, a solid season of television, with stand out episodes such as, “The Andorian Incident,” “Dear Doctor,” “Shadows of P’Jem,” and “Shuttlepod One,” which show the Enterprise crew at their best, facing difficult situations with integrity, and competency. 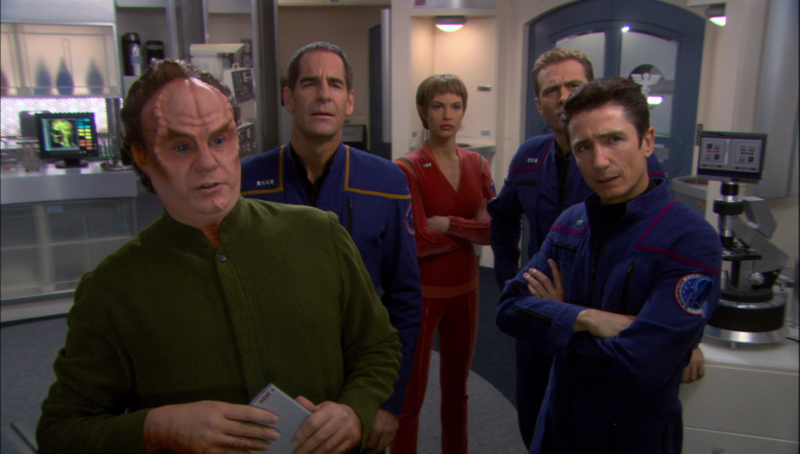 The season serves as a solid introduction to Enterprise, giving us a solid feel for the roles of each member of the ship’s senior staff, as well as placing emphasis on the show’s triangle of lead characters, Captain Archer, Sub-Commander T’Pol and Commander Tucker and the bonds they form in leading the ship. The season runs a full 26 episodes, and while there are a few duds, it stands out to me as one of the stronger intro seasons for a Star Trek program. The action is exciting, the acting is confident and the episodic stories are engaging. Season two of Enterprise is much more of the same exact style of writing and storytelling that ran throughout the first season. Because of that, it starts to feel a little stale. Crew character development somewhat plateaus during season two, trading that in for more action oriented episodes, such as visiting an Andorian-Vulcan warzone, and evacuating a Denobulan science team off a planet against a threat of annihilation for all foreigners. 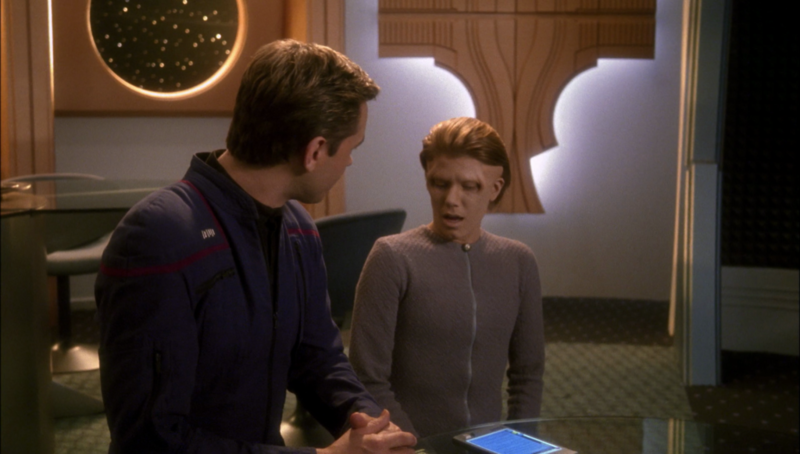 The Temporal Cold War returns once more, as the writing staff determines just what they want to do with that storyline. The majority of the season is episodic, and transitions into serialized storytelling only at the very end. 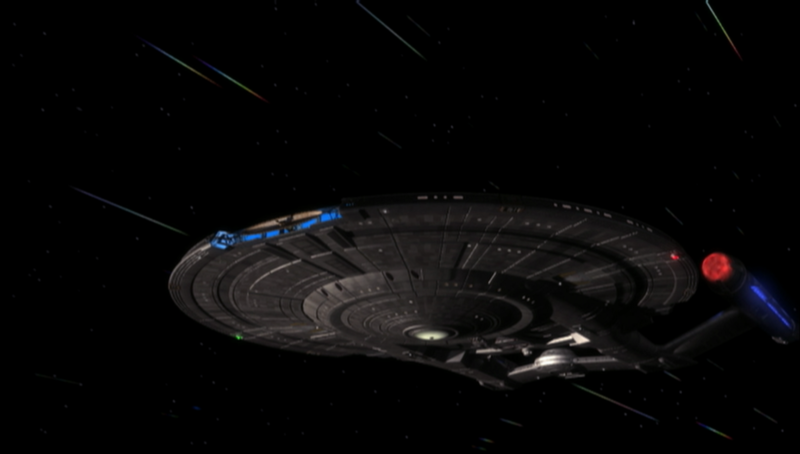 Seasons 1 and 2 of Enterprise are very much two halves of a whole. There are plenty of excellent episodes to be had in both, but they feel stylistically the same, with the occasional interjection of the Temporal Cold War, which serves only to slow the crew down as they get further and further away from home. It shows up too infrequently during the first season for us as an audience to really feel like it has any consequences, and them, when they finally decide to do something interesting with it, they’ll follow up an episode with something completely unrelated. Braga and Berman try their best to straddle the line between episodic and serialized storytelling, and as a result, their first two seasons of Enterprise kind of feel aimless. It makes me wish they had gone one way or another with their approach to the rebooting of Trek – many of the episodic episodes, especially in season 2 get progressively better, and then their momentum gets completely knocked off track because the Temporal Cold War rears its ugly head once more, and even though they try to form some big, arching X-Files style loose attempt at a connected story, they always decide to have these episodes wrap up with little consequence on the next episode. Even worse, episodes in these first two seasons frustratingly stomp over established Star Trek canon, with one off episodes in which the Enterprise encounters the Ferengi far too early, as well as the Borg left over from Star Trek First Contact, which are never fully explained in Star Trek lore. It just feels reckless and annoying for long time Trek fans. That being said, season 2 has plenty of excellent episodes – “Carbon Creek,” an episode which explores the fates of a crew of Vulcans who are stranded in 1950s Earth is a treat, “The Seventh,” in which T’Pol must follow up on a dirty secret from her past, and “First Flight,” which explores the past of the Warp 5 program on Earth. It ends on a high note, with episode 26, “The Expanse,” kicking off a season long story arch in which Captain Archer and his crew are sent into a dangerous region of space known as the Delphic Expanse, to chase down an enemy that attacked Earth and killed 7 million people. Season 3 of Enterprise should have been the saving grace of Enterprise. Facing lower ratings in season 2, UPN and Paramount Television rechristened it with the Star Trek brand name, changed the theme song to make it more upbeat, and our showrunners finally decided it was time to experiment with some serious serialized storytelling, kicking off a major storyline at the end of season 2 with the Xindi attack that sends the Enterprise on a military mission into an unknown part of space to save Earth. The problem is, is that season 3 of Enterprise should have been 13 episodes, instead of the modestly scaled back 24 episodes that it was given. It has 13-15 episodes of solid, focused, exciting and tense episodes revolving around the Enterprise’s search to find and stop the Xindi species from building a weapon to destroy Earth. Unfortunately, it’s like we had a reversal of the trends in seasons 1 and 2, where these excellent, serialized episodes are put on pause for some of the worst filler episodes I have ever seen come out of Star Trek. 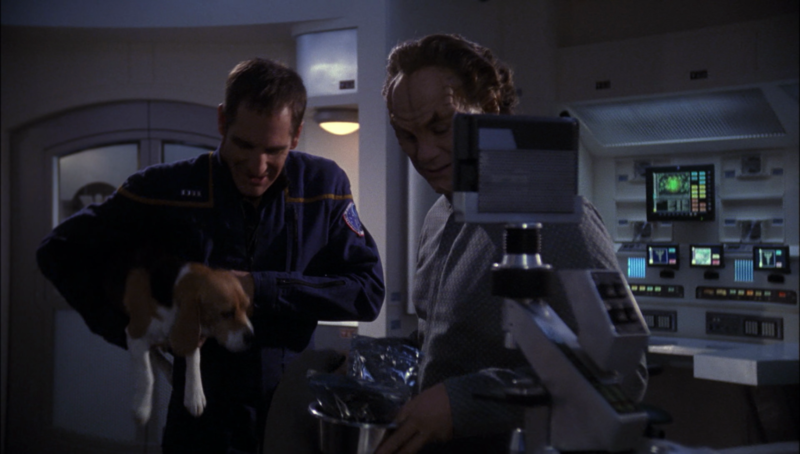 Episodes such as, “Enterprise does the Wild Wild West for no real reason,” and, “Everyone is put into a coma, let’s watch Doctor Pholox go crazy for 30 minutes,” just stop the season dead in its tracks. There are so many interesting episodes, that open up plot lines dealing with not just Earth, but the entire galaxy, that it blows my mind how awful the filler episodes are. I mean, my favorite episode of Enterprise from its entire run, “E2” which is a fantastic time travel story about how Enterprise becomes a generational ship, and the crew of the Enterprise have to work with their descendants to make it through a wormhole of sorts, but when you place it next to episodes such as, “Twilight,” which exists entirely in a vacuum and adds absolutely nothing to the ongoing storyline, it just feels weak. 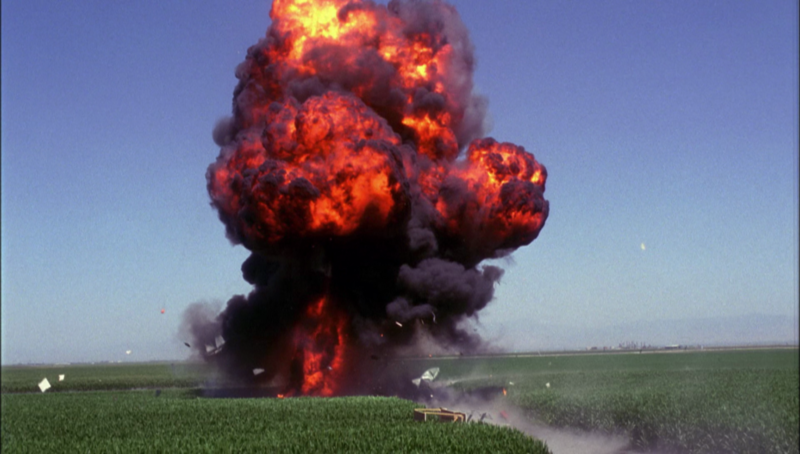 I could write page after page on season 3, but it just shows that showrunners Brannon Braga and Rick Berman just couldn’t couldn’t stick the landing that was so clearly in front of them. Thinking back on season 3, the squandered potential in a third of its 24 episodes just breaks my heart, and makes the season a chore to work through. And, as if to kick us while we’re down, the Xindi story arc ends on one of the most frustrating cliffhangers I’ve ever encountered in all my days. Thinking about Star Trek Enterprise season 3 just makes me angry. Season 4 is the light at the end of the Enterprise tunnel. Sort of. In the wake of even further declining ratings, showrunners Brannon Braga and Rick Berman were forced to take the back seat for this season, as producer Manny Coto stepped up to the plate to guide Enterprise’s 4th and final season. Recognizing that his predecessor’s attempts to disregard established Trek canon was a mistake, he instead spends the entire season attempting to restore order in the Trek universe, delivering a series of multipart episodes that stand as not only some of the best Enterprise episodes, but some of the best Star Trek television period. Season 4 kicks off with a two part episode which finally puts the Temporal Cold War to rest, placing the crew of the Enterprise in the middle of an alternate history, in which an alien race has decided to help the Nazis win World War II. Having been contacted one last time by Crewman Daniels, the Enterprise and its crew enter the fray, joining the resistance, and ultimately ending al of the Temporal Cold War in one fell swoop. You can tell Manny and his creative team thought the whole ordeal was garbage, as they literally write it all away in the story’s conclusion. Finally, Enterprise can finally shed the garbage that has been holding it back since day one. The rest of the season starts the ball rolling on the forming of the Federation, as a series of 3 and 4 episode story arcs detail the major players in the Alpha Quadrant forming a loose union to defeat a Romulan stealth ship, which leads to peace talks. Through these arcs, Earth solidifies its ties with Vulcan, help save the Klingon species, and even deal with a xenophobic faction that emerges from within our own boundaries, “Terra Prime,” with goals of expelling all foreigners. 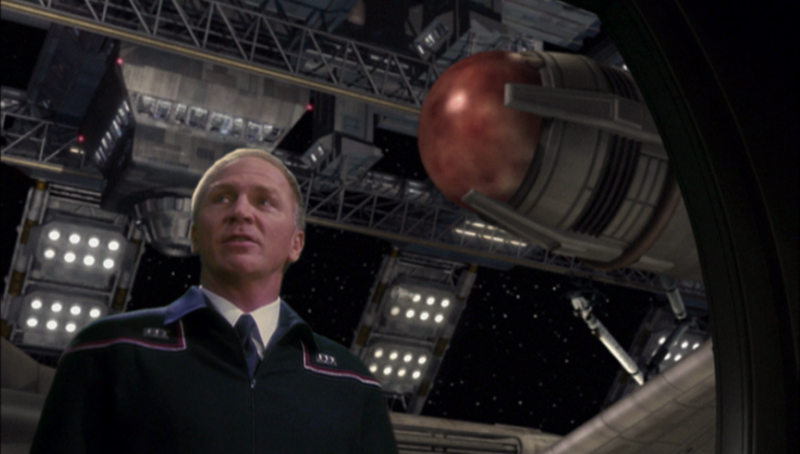 We get treated to some of the smartest, most engaging stories in Enterprise’s final season, with Brent Spiner popping up for a guest stint as the madman who created Data, and even a trip into the mirror universe for a two episode arc. Season 4 is almost a perfect season of Star Trek. Almost. 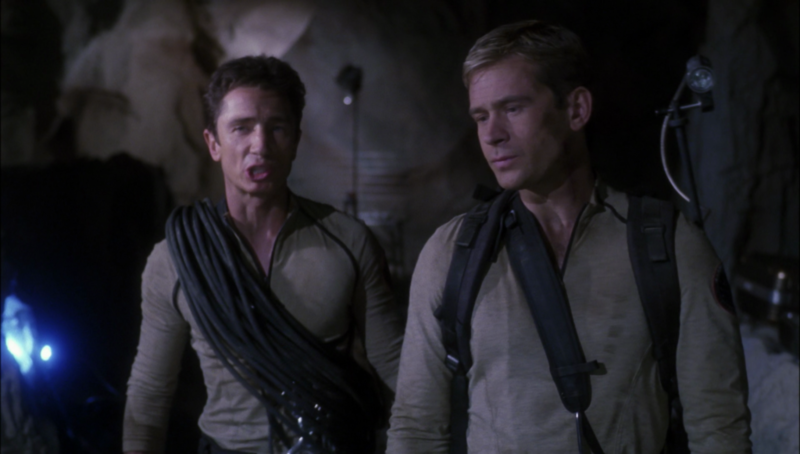 When the cancellation was announced during the filming of the mirror universe two part episode, for some reason Braga and Berman decided they needed to come back and wrap the show up, instead of letting Coto ride the wave of goodwill he’d built up with fans and critics. Their resulting work, the series finale, “These are the Voyages….” is an absolute crime against Star Trek fans. Instead of allowing the Enterprise crew take their final bows, they decided to create a Star Trek: The Next Generation frame story, in which Commander William Riker views the final mission of the NX-01 Enterprise as a holodeck simulation. It feels disingenuous, and proves that the show’s original showrunners truly had no idea what made Star Trek Enterprise work, even after 4 seasons of work on the show. I watched it for the first time nearly a month ago, and I still feel hollow and unfulfilled. We nearly had a perfect season of Enterprise. We were so close! 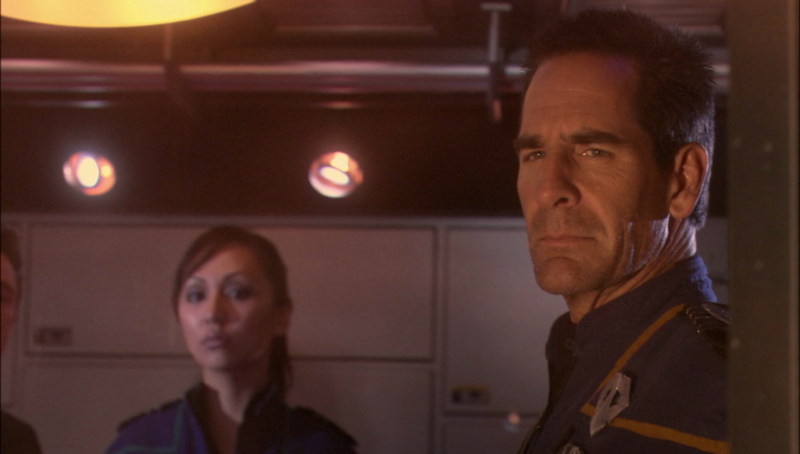 Star Trek Enterprise had the chance to be something special, but after 2 just okay seasons and one downright disappointing season, as well as a timeslot change to Friday night, season 4 just didn’t stand a chance. The show was unceremoniously cancelled, and for the first time in 18 years, Trek was off the air. 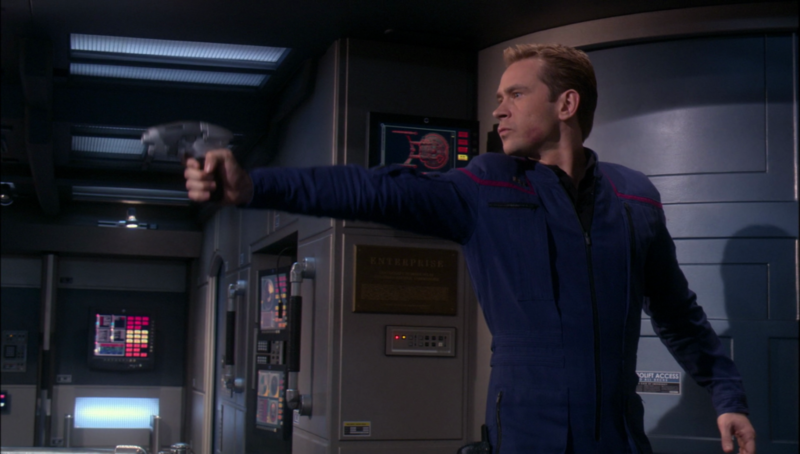 Enterprise is by no means a bad show, it just didn’t get a chance to live through the growing pains that all three of its previous shows had required to reach their prime. It was killed off in its prime, signalling the requirement of a new direction for future Trek, which would eventually lead us to the 2009 Star Trek reboot. The rest is history. The first three seasons of Enterprise, because of the way they were produced, look pretty similar in terms of visual style and quality. Enterprise hit the airwaves in 2001, at the very beginning of not just widescreen television, but also HD broadcasts over cable. Shot on 35mm 3-perf Super 35mm film, with a native aspect ratio of 1.78:1, Enterprise was scanned from its film negatives to D5 Digital Tape at a resolution of 1080p. Visual effects were rendered in 480p, and upscaled to fit the 1080p digital workflow. It was then broadcast in standard definition, as well as 720p HD widescreen for those who had the proper equipment. It switched for 1080i HD broadcast in its third season, and was run at that resolution for the remainder of its run on UPN in 2005. 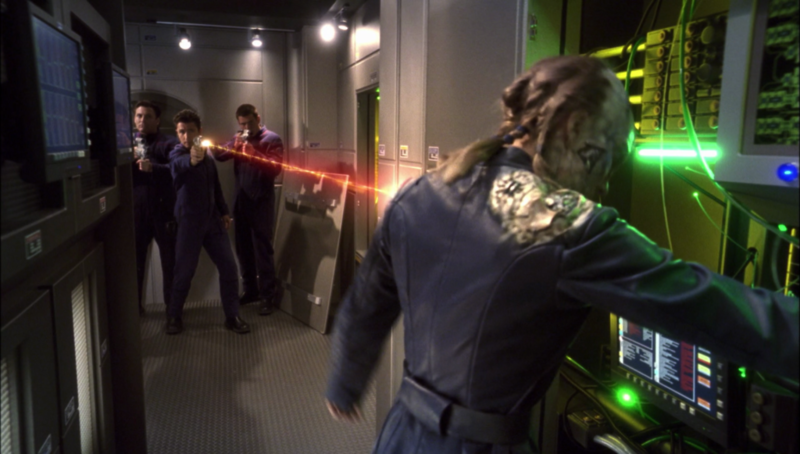 Enterprise’s first 3 seasons are marred by an overall softness, both in terms of image texture, and color timing. Colors often fall into greys, light greens, browns, and blues, none of which have a particular punchy vibrancy to them. Skin tones render consistently dull, and never really impress at all. The show has plenty to look at, and on a macro scale has a fair amount of detail in terms of set design as well as props. On top of that, due to the low resolution scans used to create the final image, the film grain that lingers over the first three seasons is often coarse and ugly. Paired with those 480p upscaled digital effects, and suddenly you have a pretty underwhelming image. Are there great scenes full of color and detail? Sure, but over nearly 60 episodes, a handful of fantastic shots don’t mean too much. For its 4th and final season, in order to save costs and keep up with the changing landscape of television production, Enterprise switched over to the Sony CineAlta digital camera, which shot a native 1080p image with an aspect ratio of 1.78:1 onto digital tape, which resulted in minimal generation loss and improved image detail throughout the 1080p workflow. Unfortunately, Enterprise looks, for better or for worse, almost exactly the same, with the same underwhelming production qualities. The only difference is that season 4 exchanges the ugly grain texture of film for a sharper, more consistent digital noise, which was common of productions using early HD digital cameras. The upscaled digital effects integrate much more naturally with an all digital workflow, and overall, season 4 looks a little less rough than its predecessors. Star Trek Enterprise was originally to released to home video on DVD with a 5.1 Dolby Digital presentation. For the Blu-ray releases, each of the four seasons received an upgrade to 5.1 DTS-Master Audio surround sound presentations. Because of its roots in television, Enterprise is not exactly a bombastic sound experience. If I was to give it a parallel to any of the released Star Trek features, it sounds like the sound team decided to model the mixes for Enterprises after the sound design of Star Trek: First Contact – flat, with minimal surround channel interaction. The Enterprise will occasionally float through the surrounds, as will the occasional sound effect, but this is most a front and center experience. 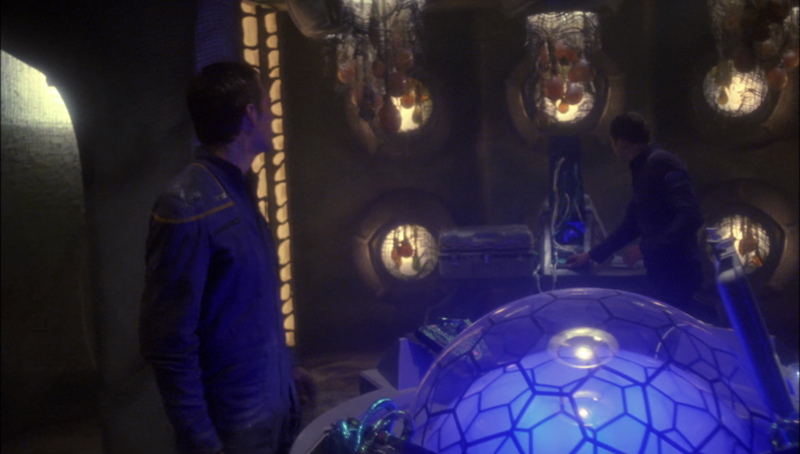 Subwoofer activity is minimal, although it occasionally gives us some action, especially with the battles with the Xindi. It’s servicable, but nothing fancy. 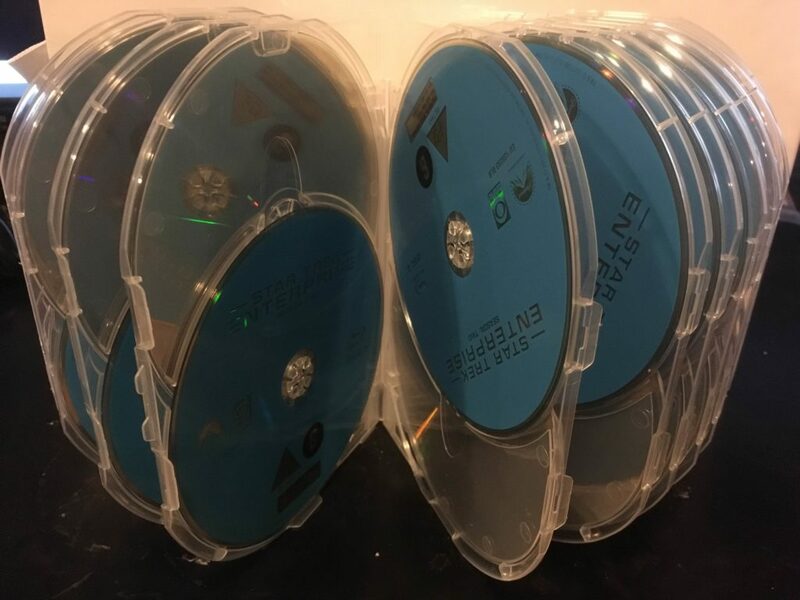 Star Trek Enterprise: The Full Journey, released to Blu-ray by Paramount UK, is packaged with an outer cardboard box, with a large monster of a plastic case for the multi tray disc holder, which holds the 24 individual Blu-ray discs the series was placed onto. 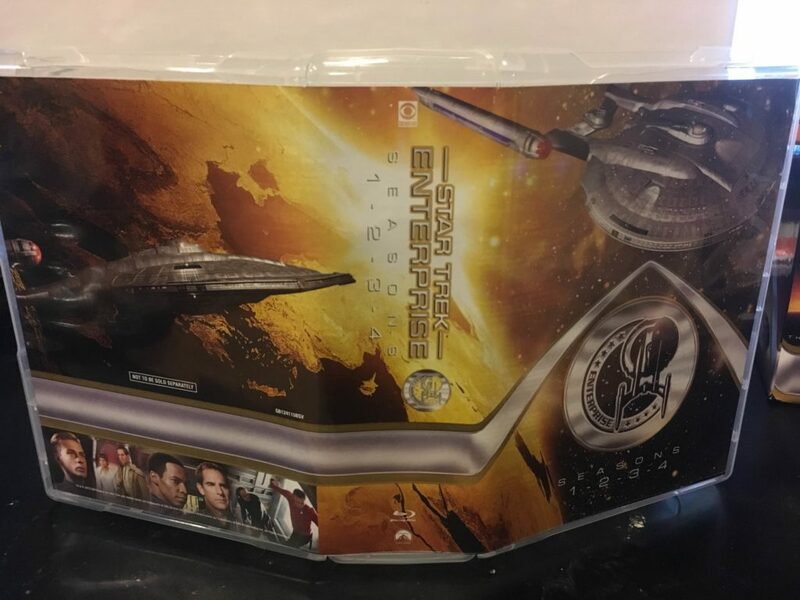 The outer box looks nice, with an orange and black color scheme, prominently featuring the Enterprise, and the emblem placed on the uniforms of its crewmates. It feels sturdy, and looks great on a shelf. The case within however, seems to have been made out of the cheapest plastic known to man. Before I even opened the box, it was damaged in shipping, and over the course of the month that I dedicated to watching the series, cracked in multiple places and deteriorated to the point where I had to exercise extreme caution in handling it. It’s big, ugly, and seems to be made out of glorified paper mache. The case does feature on the reverse side an episode guide, as well as an abbreviated list of features, which is nice. 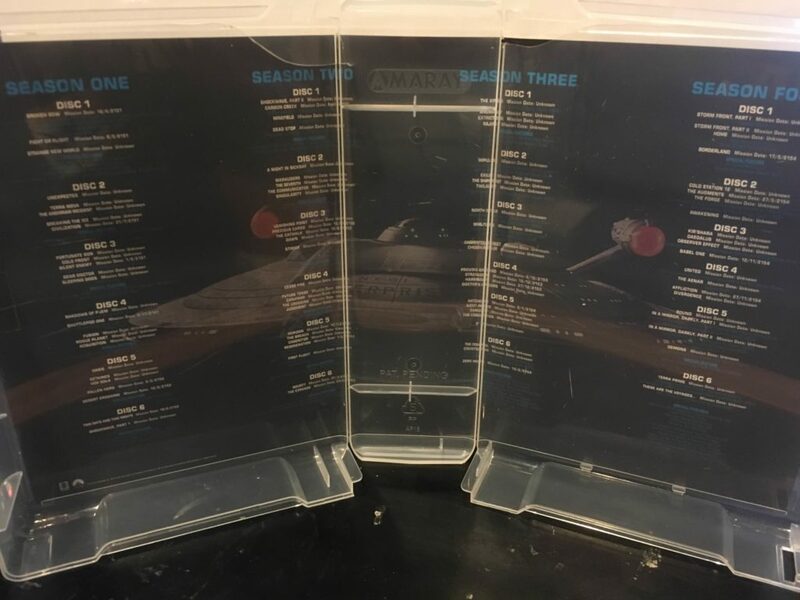 That might be the only positive thing I have to offer – Enterprise’s complete series packaging is atrocious. Onto the features – I normally try to do a thorough breakdown of each feature, but because of the sheer quantity, I have decided merely to make a list for each season. Star Trek Enterprise: The Full Journey has an incredible amount of extras, that make it a damn near encyclopedia of everything you’d want to know about Enterprise. I’d give it a perfect score in this section, but the packaging is just awful. So awful, that it may never see the light of day again, in fear that I may destroy it on accident. I know, above I tore hard into Enterprise, especially its third season, and said it didn’t have amazing audio or video, so why am I giving this one a full five star overall rating? Enterprise isn’t a perfect show by any means, but it stays positive, and presents some really cool ideas over the course of 97 episodes. It was shot down before its time, and although we’ll never know exactly why it never quite worked, or why it was cancelled, what we have is an attempt as trying something fresh. After 10+ years of the same Trek aesthetic, it changed things up. It feels vulnerable at times, and after 4 seasons, I was torn by how horrible the crew’s send off was. For the month that I chewed through Enterprise, sometimes 5 or 6 episodes at a time, it was all I talked about, and thought about during my off hours at work. Even after the worst episode of season 3, I found myself wondering where the show would take us next, what kind of mess Captain Archer and the team would have to clean up. I never once got tired of Enterprise, which is something that I can’t say about most television programs, old or new. 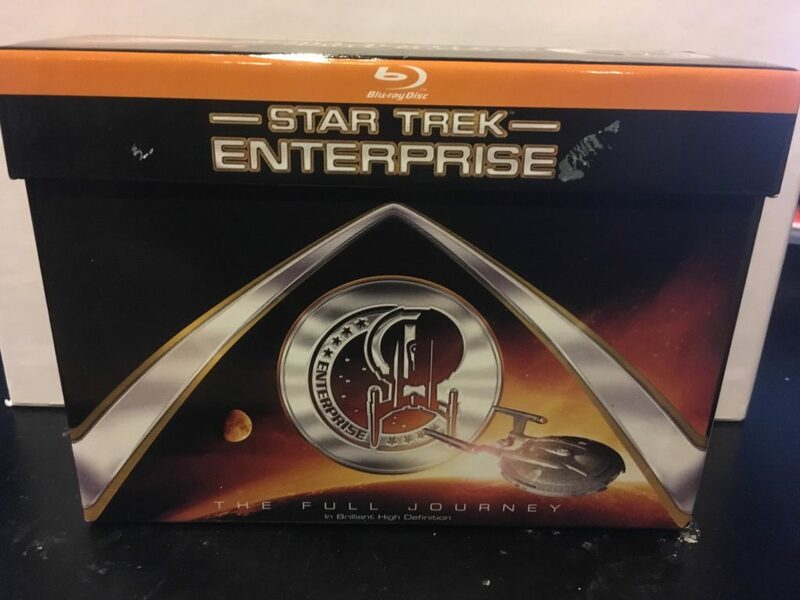 This “Full Journey” Blu-ray stands as the definitive release of Star Trek Enterprise, as I don’t think CBS or Paramount will ever have the drive or demand to re-release Enterprise with a fresh scan, or redone effects. It has an incredible wealth of special features, and is reasonably priced. I purchased it for just over 60 dollars out of the UK, and I feel at that price, you’re getting an incredible bargain. Star Trek Enterprise is a flawed 4 seasons, but absolutely worth the price of entry, if just to get a glimpse into the end of nearly twenty years of straight TV Trek. Not only is it recommended, but its damn near indispensable.